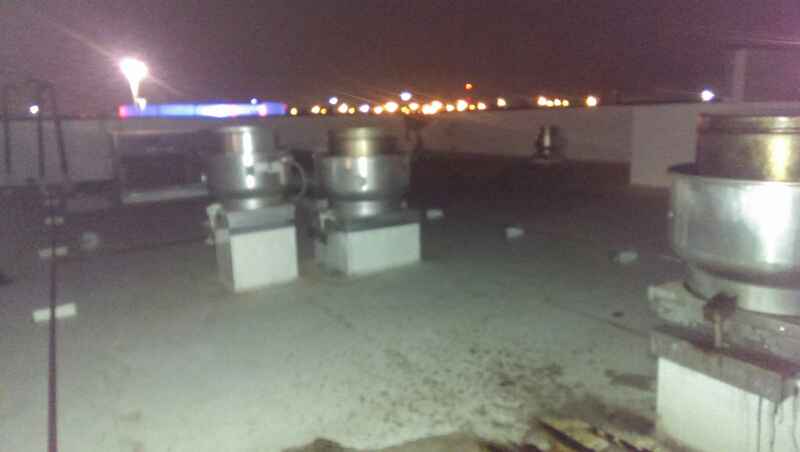 There is a common misunderstanding between kitchen exhaust cleaning service providers and facility managers regarding grease build up on their roof tops. Most restaurant or Facility Managers feel that if there is grease on their roof top then there must be a deficiency in the work being performed by their service provider. Often this can be the case. However, there are some cases that grease can accumulate on your roof top in between services. There are three different ways that grease can accumulate on your roof top. 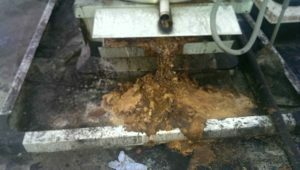 It is important to be able to evaluate whether the service being performed is below par or if there is a need for preventative maintenance at your facility by knowing how grease accumulates and what to look for. The first way that grease can accumulate on the roof top is through poor waste water management during the cleaning process. This is the easiest of the three to evaluate, though it does require follow up by the restaurant staff. During the cleaning process there are a few ways that grease can accumulate on the roof top. An example of poor waste water management is when a technician is spraying the bottom of the fan blades with the fan off the duct or when the fan is held open by the hinge kit. What typically can happen in this example is the technician sprays the bottom of the blades while allowing them to spin. By doing this, the blades spin and grease and water are slung out of the fan on to wall, roof top, A/C units, etc. This can cause multiple problems but typically can be detected easily. When evaluating your system to see if this is happening, you need to look for a spray pattern the size of the bowl of the exhaust fan. 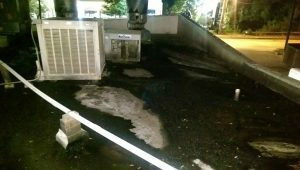 If this is occurring, grease will be accumulating in a concentrated area in the pattern of a “v.” The other way grease can accumulate is if the technician allows the waste water to run out of the exhaust fan and on to the roof top. This can be detected by evaluating how the grease is accumulating from the fan. If the grease is fairly light and extends down the roof toward the drain, then the grease accumulation was probably caused by poor waste water management. The second way grease can accumulate on the roof top is through grease leaking from the fan between services. This can happen for multiple reasons such as excessive rain between services, improper seals on the joints of the exhaust fan, and a bad seal between the fan base and the duct curb. When this happens, grease leaks from around the base of the exhaust fan, from the seams of the reservoir at the base of the exhaust fan, or from grease overflowing from the grease collection box mounted under the drain of the exhaust fan. All of these are fairly easy to detect. In most cases if you are getting grease accumulation between services, the grease will be accumulating in concentrated areas next to the fan. On roofs with a slight slope the grease can spread a little due to rain water. You will also be able to tell where the grease is leaking by looking at the side of the duct curb under the fan and at the grease collection box to look for drip marks where the grease has been leaking from. In this situation, we recommend to our customers that a preventative maintenance product be installed to protect against roof damage. There are many types of roof top containment products on the market, but your service provider should be able to walk you through your options and what works best for you. The third way grease can accumulate on your roof top is through airborne particles. These can accumulate on the roof top due to the frequency of your system not being set properly. Typically when this happens grease is collecting in the base of the exhaust fan in a liquid state. Once the grease fills to a certain level, the air flow starts to sling the grease out of the fan reservoir and into the air causing grease to accumulate throughout the roof top in the form of small little drops of grease. At times, it can also accumulate in the form of a light film. If this begins to occur, you need to contact your service provider and discuss evaluating your frequency over the next several months to get it set properly where the problem will not continue. If we can be of any assistance to you please do not hesitate to call at 972-704-1812 or you can visit us at our website at www.thehoodboss.com. Jeff started his journey into the Kitchen Exhaust Cleaning as a crew leader and quality assurance manager for The Disney World Contract, one of the largest kitchen exhaust cleaning contracts in the industry. 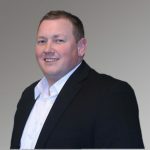 Jeff, utilizing his knowledge and expertise, joined the sales side of the process, and for the last eight years he has been helping customers build smart, safe and reliable Grease Management Programs. Jeff’s diverse knowledge of the industry has allowed him to develop specialized products that aid in helping prevent damage to rooftops during the cleaning process.